Two and one-half days of riding will be offered. Tire kickin, hot laps, bench racing, and attitude adjustments start Thursday afternoon with a “Tour of the Town” followed by a “mixer” at the hotel 4 PM to 6 PM. First ride 10 AM Friday, starting from the parking lot of the Borrego Springs Resort. Each day’s ride will start from this same spot. Early Bird ride will be provided on Wednesday, February 27th leaving at 10:00 with a tour around the area to be announced. The Themed banquet on Saturday evening…Disco! Be prepared for both foul and fair weather! Ya never know what may occur! The Borrego Springs Resort (1-888-826-7734) is the headquarters hotel and the location for the Saturday night banquet. Our special room rate ($147 inclusive, 2 people) can be obtained by telling the reservationist that you are with the AMCA. You must tell them this to get the special pricing! Room block is released Feb. 1st. Make your reservations early; we expect to sell out at the headquarters hotel and this is the height of the season for Borrego Springs. Room assignments will be determined by the hotel and by SoCal with preference given to duration of stay and length of participation at this event. Registration fee is $125 dollars per rider which includes 2 days continental breakfast, 1 banquet dinner, 1 lunch, daily hospitality refreshments (non Alcoholic) and a “2019” T-shirt. Extra shirts will be offered for sale at $15 each, preorder only. · Pre registration is mandatory! AMCA membership is mandatory! · All riders must possess a valid driver’s license. · All motorcycles must be properly registered and insured. Full Payment must be received by February 1, 2019. Our special room block rate will be released February 1st. Make your plans now for another great event in the California desert. 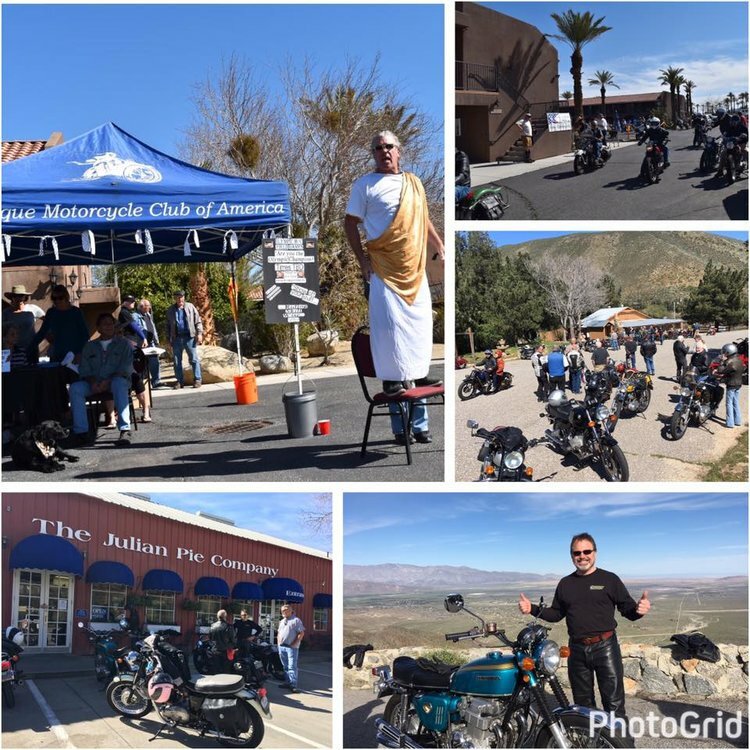 Snapshots from the 2017 SoCal AMCA Winter Road Run.